I had occasion to be in central Edinburgh today. 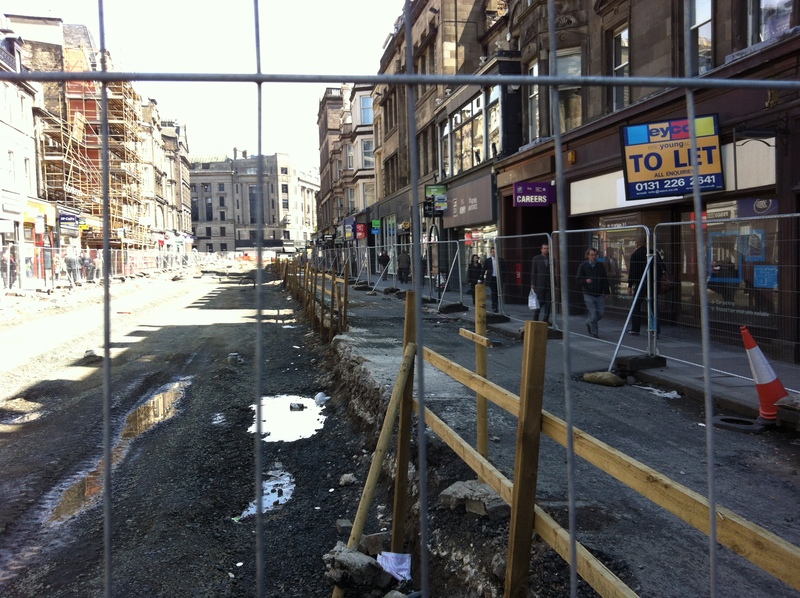 This is what Shandwick Place looks like at the moment, thanks to the lunatics who visited on the city an incredibly expensive project that it neither wants nor needs. Check out the number of empty shops, and ‘To Let’ signs. It’s the same all the way along Princes Street. The tragedy is compounded by the fact that the people who did it will walk away Scott free from the inconvenience, misery and unemployment they’ve caused. I don’t believe that is right. They should all be called to account for the consequences of their actions, and surcharged for the cost. This might seem like a futile, empty gesture, but at least it would ensure that they carried the shame of besmirching their city for the rest of their lives. Picked up a copy of Funeral Note last week with the intention of reading it when I went back to where I work. Mmm, ended up reading it between EDI-LHR-JFK-PAP with only the last dozen or so pages left by the time I got to Port au Prince. Stuck the kettle on and settled down to get to the last page AND !!!! That’s a lot of aeroplanes. You don’t need to speculate; it’s obvious. It seems the “do gooders” aren’t happy unless they have a project lilke that one in Edinburgh. We had the same circumstance in the Valley (Phoenix and Tempe) when the powers that be decided we needed “light rail” and ensuing disruption closed businesses and dis-employed people for over two years. It’s not only a shame, it should be a crime! Usually I will think the best of people, but not in this case. This lot are guilty of a gross betrayal of the people who elected them, on the basis of their promises to run the city wisely and well. At least Quintion gets to kill his politicians off or does he…………..
Who? Are you confusing me with the excellent Paul Johnston’s Mr Dalrymple?